Sticky: The Personal Record Thread! Cracked my 30 with a 28! Best part is that I used ten flags and maintained a not-completely-disgusting 3BV on such an easy board. Rest of the stats are bad though. Guys. Holy crap. I shattered the 20 barrier. My previous best was 27.15. I don't even know. Congrats tommy, almost a sub10! Ahah thanks. Up until yesterday I mainly played int, since I believed it was more fun. (Generally I played about 2 hours of int and 1 hour of expert). But now I'm pretty much not gonna play int again until I get a sub90 on exp. Thanks! 29 NF sub50s That means I have more than Konstantin. Totals: 45x1, 46x5, 47x6, 48x5, 49x12. NF player. Best scores 1-10-39. 44.98 on vienna, 45.55 on msx (today), 45.90 on arb, 47.39 on clone (just now). MMO-Minesweeper WR: 113,126 squares claimed; 99,475 squares cleared. Not a particularly amazing game, 125 3BV (12 openings though) and only 3.8 cl/s, but a record is a record. few month i have not played except from density. Finally beat my 2.5-month standing 19.53 with a 19.13! Feels good, and it's slightly quicker as well - a .2 3bvs improvement. Hooray. Heh, thanks. I'm actually rather good at NF compared to most flaggers (check my signature), so I think I'll stick with both. I neglect NF a little though, so you're right in that I should play it more. 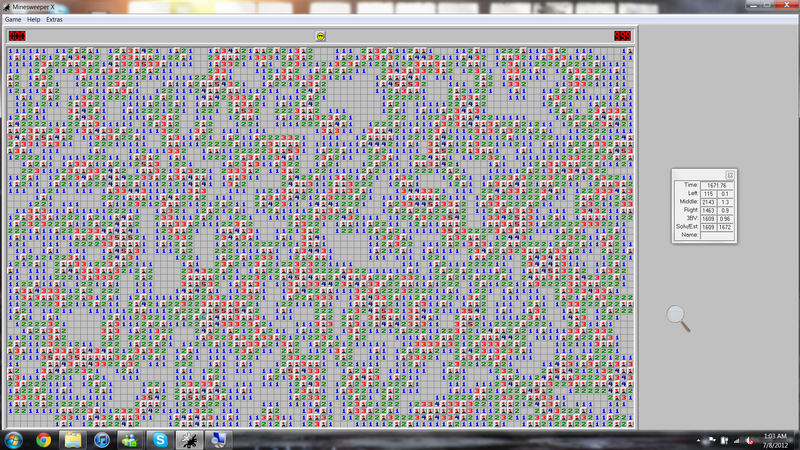 I'm not sure what the record is, but I did complete a 100x110 board with 1719 mines (=Intermediate density) a while ago. I think I remember someone completing 100x100 with 2063 mines (=Expert density) but I can't find the proof right now. I made my own version which used scroll bars to allow for boards bigger than your screen. It's not an official clone, but it's good enough for unofficial events like this. Watson, most people aren't generally interested in completing the most mines, but rather the largest board of either intermediate or expert density. For example you could complete a 1000x1000 board if it had 999,999 mines quite easiy. Or similarly huge boards with very low density, could still dwarf the current record of most mines solved. E.g. on a 112x94 board, expert density would require 2171.4 mines, so we round up to 2172 (that is, at least expert density, rounding down would give a board not quite as dense as expert), or intermediate density would require 1645 mines exactly. On that topic, I've always wondered what the optimally hardest percentage of mine density is, or if it varies across board sizes. Just to pick a nice number, I'll conjecture that it moves toward 1/sqrt2 as board sizes become larger. I don't see a need to limit ourselves to Intermediate and Expert densities, which are pretty arbitrary, and it'd be interesting to see, for example, the record for largest board on which 50% density is achieved.